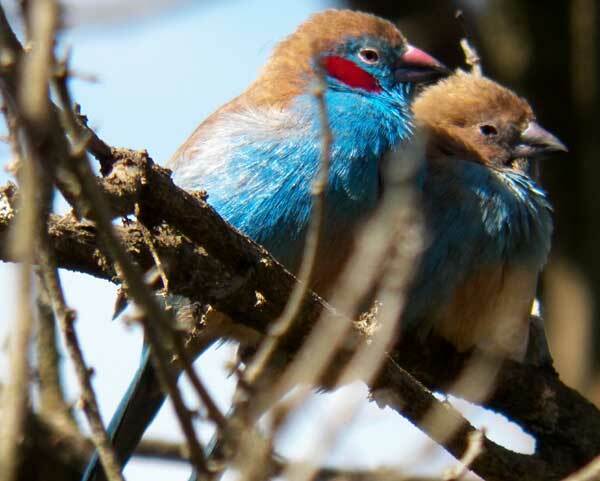 This male is on the left as this pair of red-cheeked cordon-bleu rest in a Nairobi Garden. Kenya. December 2012. These small birds (about 12 cm from beak to vent) have red, conical, seed-cracking bills. They inhabit dry habitats and also gardens and agricultural settings. Common through much of sub-Saharan Africa. Only male birds have the namesake red cheek.